It takes just 10 seconds to scope out your surroundings and spot and avoid danger. Make this “ten-second scan” a habit in your everyday work as a real estate professional. Then share it with someone else. 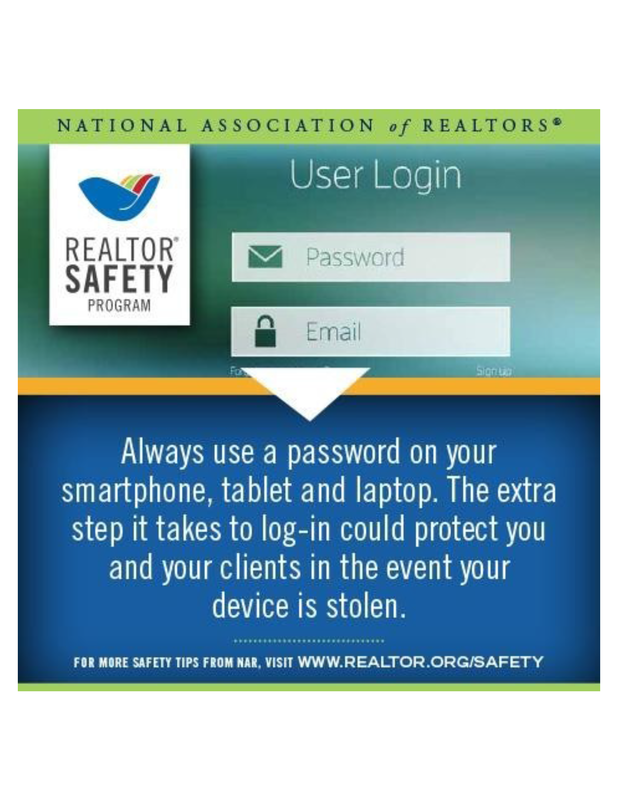 The National Association of REALTORS® and this organization have worked hard to keep REALTOR® Safety foremost in everyone’s minds. But what about your clients? They, too, face some dangers in allowing strangers into their homes or visiting other people’s properties. Don't leave personal information like mail or bills out in the open where anyone can see it. Be sure to lock down your computer and lock up your laptop and any other expensive, easy-to-pocket electronics, like iPods, before your showing. Finally, when you leave a client’s property, whether after an open house or a standard showing, make sure that all doors and windows are locked. Thieves commonly use open houses to scout for valuables and possible points of entry, then return after the agent leaves.